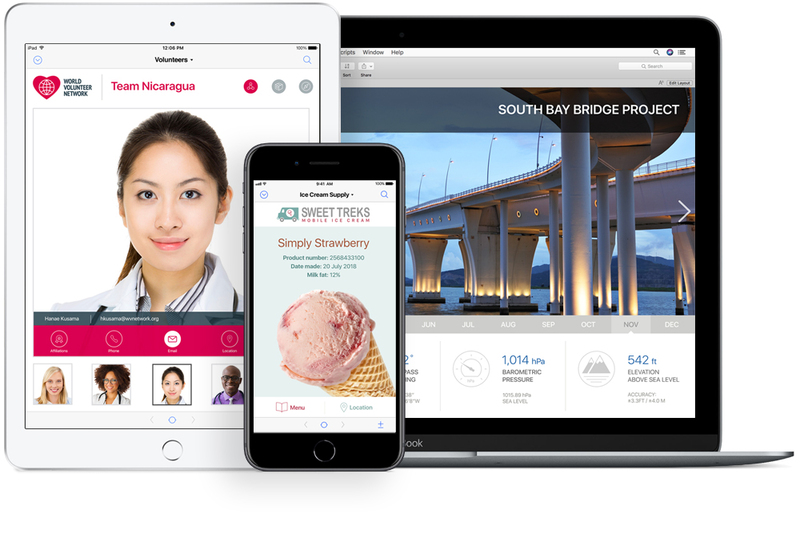 We create powerful and intuitive data driven apps built on the FileMaker Workplace Innovation Platform. We build solutions for businesses, non-profits, governmental agencies, departmental teams and more. We’ll help you improve workflow, increase efficiency, and visualize your data with custom solutions that run on Windows®, Mac®, iPhone®, iPad® and on the web. FileMaker apps run on Windows, Mac, iPad, iPhone and the web. From a single user to a network of desktop clients, mobile devices and web users, we’ll configure a scalable solution that goes everywhere your business takes you. We use FileMaker as the foundation for your custom workplace innovation platform. Custom apps can be created for any task… organize contacts, track inventory, manage events and much, much more. As a FileMaker® Certified Developer, we offer the right expertise for your organization’s unique needs. Get in touch to learn how we can design a custom solution to streamline your scattered information and inefficient processes. Has your business data gone wild? Do you have Excel spreadsheets just to track other spreadsheets? Get in touch for a free data checkup and learn how affordable a custom solution can be. Partner with a vetted professional. FileMaker Business Alliance members have the experience, knowledge and skill to deliver solutions to enhance your workflow and productivity whether you use Windows, Mac, iPad, iPhone or the web to get your work done. Copyright © 2014-2019 Kansas DataWorks. The FileMaker Certified Developer logo and FileMaker WebDirect are trademarks of FileMaker, Inc. in the United States and other countries. FileMaker is a trademark of FileMaker, Inc., registered in the U.S. and other countries. Mac, iPad and iPhone are registered trademarks of Apple Inc. Windows, Excel and Word are registered trademarks or trademarks of Microsoft Corporation in the United States and/or other countries.